You’re going to want to visit State Theatre New Jersey on April 12—because you’ve never heard violin like this before! Classically trained virtuoso violinist Kevin "Kev Marcus" Sylvester and violist Wil "Wil B” Baptiste—the dynamic duo better known as Black Violin—are boundary-defying performers who merge classical, hip-hop, jazz, blues, and R&B into an electrifying style all their own that can only be described as “classical boom.” Black Violin has shared stages with many of the top names including Kanye West, Aerosmith, and Tom Petty, and has collaborated with Wu-Tang Clan, Wyclef Jean, and Alicia Keys. Joined by turntable whiz DJ SPS and Nat Stokes on drums, they smash musical stereotypes; enthralling fans of Bach, Beyoncé, and beyond. 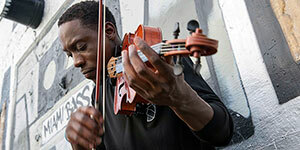 The violin duo first met up at their Fort Lauderdale high school before reuniting post-college to form Black Violin. Taking their name from the great swing-era African-American violinist Stuff Smith's influential album, this inspiring duo has been named one of South by Southwest's hottest bands, clinched a Showtime at the Apollo Legend title Backed live by their band featuring turntable ace DJ TK (Dwayne Dayal), they've given rise to a new musical voice that is cool, exquisite, and unique all at once. The band is endorsed by Yamaha Music and has partnered with the National Association for Music Manufacturers to continue the fight for accessible music education for students. In addition to this, Black Violin has performed for more than 100,000 students in the past year all across North America and Europe. Schools are invited to State Theatre New Jersey to attend our school-only performances which are Tuesday, April 10, 2018 at 10:30am and Thursday, April 12, 2018 at 10:30am. 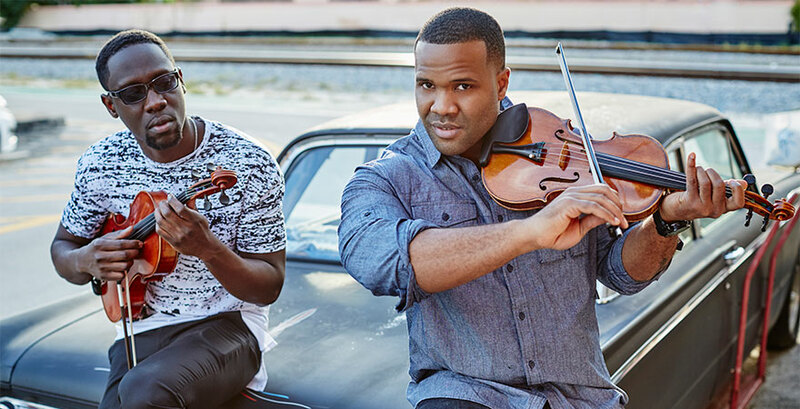 As they enthrall fans of all types of music, Black Violin also offers positive messages about believing in yourself and pursuing your dreams. Come visit State Theatre New Jersey on Thursday, April 12 at 7pm for a show that you’ll never forget!